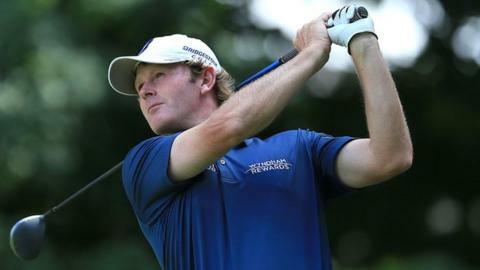 American Brandt Snedeker will take a one-shot lead into the final round of the Canadian Open after carding a six-under-par 66 at Glen Abbey in Ontario. The world number 23 eagled the par-five 18th to lead on nine under from US Open champion Dustin Johnson (70) and Canadian amateur Jared du Toit (71). World number 309 Luke List, joint leader for the first two days, slipped seven shots adrift after a 77. Scotland's Martin Laird compiled five birdies in a 68 and is six under. World number one and defending champion Jason Day returned a round of 69 and is tied for 28th with 31-year-old List, who began with a bogey and had two double bogeys and a triple bogey seven on the back nine. Snedeker overpowered the 18th, hitting a 378-yard drive and a 121-yard approach to set up the six-foot eagle putt. Du Toit, 21, bidding to become first Canadian to win the event for 62 years - and the first amateur to triumph on the PGA Tour in 25 seasons - also eagled the final hole, holing a 40-footer for a 70. Asked to evaluate his prospects for the final round, Snedeker said: "I think I'm going to be the most hated man in Canada, but it's going to be a lot of fun trying to figure it out."